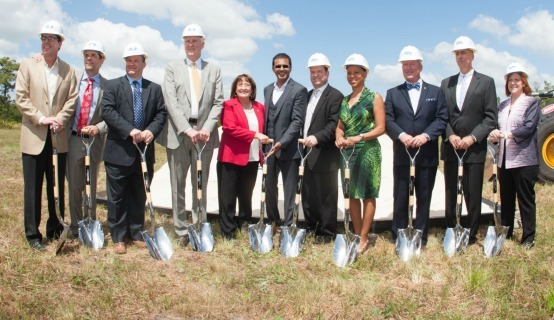 Orange County Mayor Teresa Jacobs joined business and community leaders at the groundbreaking for the new headquarters of the United States Tennis Association (USTA) in Lake Nona. The new state-of-the-art facility in east Orange County will be home to the USTA’s Community Tennis and Player Development divisions, which will create jobs and attract new investments in Central Florida. The 100-plus court tennis center is scheduled for completion in late 2016. The campus will be accessible to youth and recreational players as well as collegiate and professional tour-level athletes. A consortium of regional and economic development agencies partnered with the Tavistock Group on the headquarters relocation. Moving the Player Development division national headquarters from Boca Raton to Orlando will provide great regional opportunities for the next generation of American tennis champions. The facility will host tennis events ranging from 10-and-under team tennis to national championships. Joining Mayor Jacobs at the event were Rasesh Thakkar and Thad Seymour with Tavistock Group and Lake Nona, City of Orlando Mayor Buddy Dyer, as well as representatives from Visit Orlando, the University of Central Florida, the state of Florida and the USTA partners and athletes. The campus will be located on 63-acres of land and will include the following: a Tournament and League Area; Team USA area featuring 12 Plexicushion hard courts; a high performance and player development area housing eight DecoTurf hard courts and eight European red clay courts; six rebound ace indoor courts; eight 36-foot and eight 60-foot PowerGame courts; a tennis pro shop, fitness area, locker rooms, player lounge, and restaurant. USTA offices will occupy the second floor. are available for use by the media and are located on Flickr.